"U.S. Rep. Mike Conaway staking legacy on passing politically tricky farm bill" was first published by The Texas Tribune, a nonprofit, nonpartisan media organization that informs Texans — and engages with them — about public policy, politics, government and statewide issues. SAN ANGELO – In a dusty warehouse that looks like a set from the movie "Footloose," Brian May pulled wool out of a bale and held it up for an audience that included several members of Congress. “She would use this in her haute couture line,” explained May, president of Angelo State University, referencing fashion designer Donna Karan as he stretched the wool apart. This high-end wool – also used frequently by the likes of Hugo Boss and Escada – was cleaned at this processing plant on the outskirts of San Angelo. “We’re going to listen,” Conaway said at the outset of the tour. To keep up with competition and technology, farmers buy pieces of equipment that individually are worth several times more than many Texans’ mortgages — potentially, only to see an act of nature destroy their crops. He further argues that the American public unwittingly “gets a deal” every time they pay for food. “It’s important to anyone who eats,” he said. “In order to write a strong farm bill, I need to know what’s important,” said U.S. Rep. Roger Marshall, a Kansas Republican, who was on the tour. In 2014, the bill passed Congress through a coalition of Democrats and Republicans. The state’s two senators – John Cornyn and Ted Cruz – voted against it, as did a dozen or so U.S. House Republicans and Democrats from Texas. “So why should taxpayers pay for two programs that can only pass Congress through the ridiculous sausage-making that Americans hate about Washington?" Furthermore, President Donald Trump’s proposed budget — drafted by a former Tea Party member of Congress who now runs his budget office — slashed farm bill spending by billions. “I bet there’s never been eight congressmen in San Angelo, before, ever,” Richard Thorpe III, the president of the Texas and Southwestern Cattle Raisers Association, said on Tuesday. “Certainly, the chairman of Agriculture has his finger prints all over this farm bill,” Marshall, the Kansas Republican, said of Conaway. “We appreciate the chairman for what he’s doing ... but we also expect him to deliver,” said Joe Reed, the president of the Corn Producers Association of Texas. U.S. Rep. Mike Conaway staking legacy on passing politically tricky farm bill By Abby Livingston August 2, 2017 *Correction appended. SAN ANGELO – In a dusty warehouse that looks like a set from the movie "Footloose," Brian May pulled wool out of a bale and held it up for an audience that included several members of Congress. “She would use this in her haute couture line,” explained May, president of Angelo State University, referencing fashion designer Donna Karan as he stretched the wool apart. This high-end wool – also used frequently by the likes of Hugo Boss and Escada – was cleaned at this processing plant on the outskirts of San Angelo. May's presentation was part of a series from farmers and educators who spent the early part of this week making the case to eight congressmen from as far as Minnesota and Florida for the farm bill, a massive piece of legislation that Congress usually passes every five years. U.S. Rep. Mike Conaway, a Midland Republican and chairman of the U.S. House Agriculture Committee, spearheaded this symposium in his sprawling West Texas 11th District. The congressmen, Capitol Hill staffers and reporters spent two days touring a cotton field, listening to agriculture trade association leaders and hearing out the economic worries of hundreds of Texas farmers. “We’re going to listen,” Conaway said at the outset of the tour. Their concerns were plenty: ticks, foot-and-mouth disease, lethal fungi, trade regulation, drought, conservation, crop insurance, the cost of cotton seeds and then the cost of cotton at market. But most of all, they fear going bust. To keep up with competition and technology, farmers buy pieces of equipment that individually are worth several times more than many Texans’ mortgages — potentially, only to see an act of nature destroy their crops. One after another, farmers attested to being fifth-, sixth-, seventh-, even eighth-generation tenants of the family land, a proud tradition they now dread is no longer economically viable for their sons and daughters. The first farm bill dates back to 1933 and the Great Depression and the Dust Bowl crisis that plagued the midwest. Over the years, the legislation expanded to its modern form: a mix of food assistance for the poor and subsidies to farmers. The resulting coalition behind the bill tends to be conservative rural congressmen like Conaway and U.S. Rep. Jodey Arrington of Lubbock, who also attended the summit; and moderates and urban liberals aiming to secure funding to feed the poor. Neither objective could easily pass through Congress without being tied to the other. The vast majority of the farm bill funds the Supplemental Nutrition Assistance Program (SNAP), known formerly as food stamps. Conaway makes this angle key to his case to the public: He argues that the support to the farm industry creates the most “abundant, safest and affordable — emphasis on affordable — food and fiber supply of any developed nation in the world.” He further argues that the American public unwittingly “gets a deal” every time they pay for food. “It’s important to anyone who eats,” he said. But smaller amounts of the bill pay for assistance to farmers: crop insurance, conservation programs and aid amid disasters including wildfires, drought, and widespread crop damage caused by feral hogs. Those were the primary concerns of the farmers and ranchers in San Angelo this week. 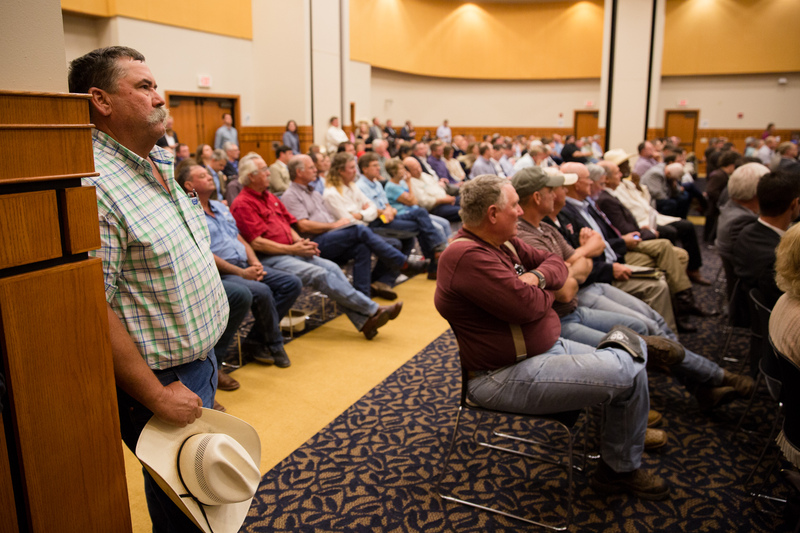 Texan farmers fill the university center at Angelo State University to speak with U.S. Rep. Mike Conaway and other members of the House Committee on Agriculture about the 2018 farm bill on July 31, 2017. Austin Price / The Texas Tribune The farm bill is supposed to pass every five years, but the last round proved particularly difficult. The Senate and House ended up passing the last farm bill in 2014, two years later than expected, and authorized nearly $1 trillion in spending, according to the Congressional Budget Office. “In order to write a strong farm bill, I need to know what’s important,” said U.S. Rep. Roger Marshall, a Kansas Republican, who was on the tour. But the next farm bill already has opponents, even though it has yet to be written. State Sen. Konni Burton, R-Fort Worth, chimed in on Tuesday, acknowledging that her opposition to the farm bill faces both Democrats and Republicans. In 2014, the bill passed Congress through a coalition of Democrats and Republicans. The state’s two senators – John Cornyn and Ted Cruz – voted against it, as did a dozen or so U.S. House Republicans and Democrats from Texas. Fiscal hawks like the Club for Growth and Heritage Foundation regularly campaign against it. “The farm bill is an unholy marriage between farm subsidies and food stamps,” emailed Andy Roth of the Club for Growth. “If we had an honest debate about each issue separately, support for each would fail. “ “So why should taxpayers pay for two programs that can only pass Congress through the ridiculous sausage-making that Americans hate about Washington?" Conaway had no patience for those interest groups. “Every single one of those guys that are against it live in that 20 percent bracket that don’t care what the cost of food is,” he said. “[They] couldn’t give a rat’s rear end, and so that’s the ones who hate it.” And as conservative as West Texas is, the fiscally conservative Tea Party scares the daylights out of these farmers when it comes to the farm bill. Furthermore, President Donald Trump’s proposed budget — drafted by a former Tea Party member of Congress who now runs his budget office — slashed farm bill spending by billions. Conaway said he is not ready to worry yet. “I’ve gotten a couple of anecdotes that the president wants crop insurance left alone. That the budget that he put out, I don’t think necessarily reflected his thoughts,” Conaway told reporters. “And as he had the opportunity to talk to members of Congress and the Senate about what we're doing and what we’re trying to get done he’s talked about that may not have been the best approach of what he wants to get done.” As Conaway hosted the congressional delegation across West Texas, their visit did not go unnoticed. “I bet there’s never been eight congressmen in San Angelo, before, ever,” Richard Thorpe III, the president of the Texas and Southwestern Cattle Raisers Association, said on Tuesday. “And to get those people, those congressmen, here to listen to everybody ... is a show of his tremendous leadership, and we’re so lucky to have Congressman Conaway, the chair now at the Ag Committee.” Conaway, a certified public accountant in his past civilian life, is a former chairman of the House Ethics Committee and is also running the chamber's investigation into Russian interference in the 2016 election. And yet, he is staking his legacy in Congress on this issue and this bill. “Certainly, the chairman of Agriculture has his finger prints all over this farm bill,” Marshall, the Kansas Republican, said of Conaway. Conaway's likely got one shot at it: Republican chairmen are term-limited, and he will wind down his tenure as chairman of the Agriculture Committee in a few years. When his time is up, a portrait will hang of Conaway in the House Agriculture Committee hearing room. Conaway said that failing at this bill would add a measure of illegitimacy to that honor. “I will not have earned it unless I get a farm bill passed.” Folks back in Texas made sure he knew they felt the same way. “We appreciate the chairman for what he’s doing ... but we also expect him to deliver,” said Joe Reed, the president of the Corn Producers Association of Texas. “He said last night he going to have to make some people mad,” Reed added. “I hope it’s not us.” Disclosure: The Texas and Southwestern Cattle Raisers Association has been a financial supporter of The Texas Tribune. A complete list of Tribune donors and sponsors is available here. Correction: Due to an editing error, an earlier version of this story misidentified the university where Brian May is currently president.&nbsp; Read related Tribune coverage The Texas Republican helping to calm the waters in Washington Red River farmers hope Trump administration resolves land dispute "U.S. Rep. Mike Conaway staking legacy on passing politically tricky farm bill" was first published at by The Texas Tribune, a nonprofit, nonpartisan media organization that informs Texans — and engages with them — about public policy, politics, government and statewide issues. Link back to the original article, which is located at https://www.texastribune.org/2017/08/02/congressman-mike-conaway-stakes-legacy-farm-bill/.